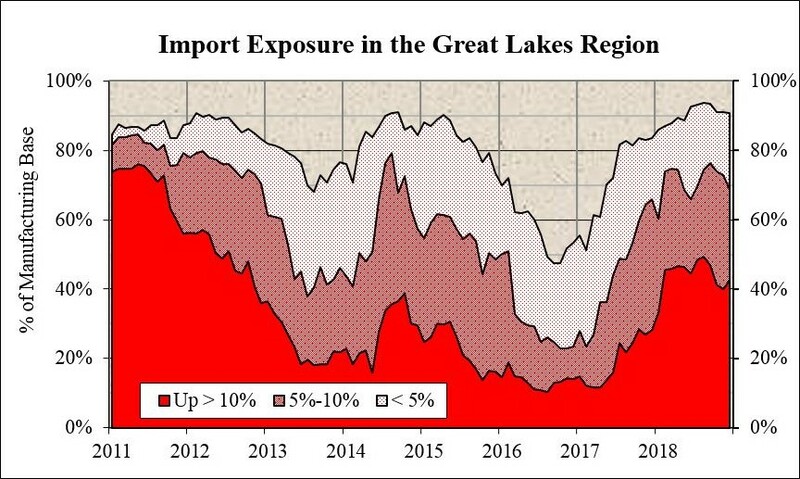 The Great Lakes TAAC has long tracked and analyzed U.S. imports and the potential import exposure on manufacturers in our region (Indiana, Michigan, and Ohio). However, we’ve recently improved this information and are now going to make it available on our website. GLTAAC will post monthly updates, as the import data are released. 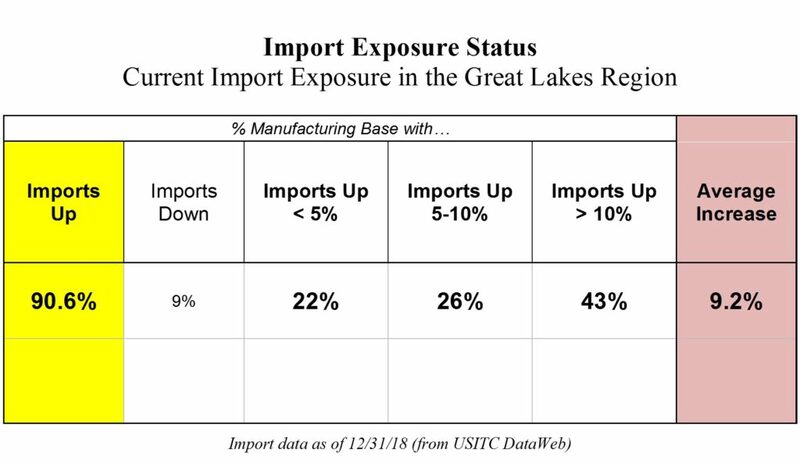 At a glance, GLTAAC’s Import Exposure Status table provides a sense of the breadth and depth of import competition faced by manufacturers in the Great Lakes region. These are macro level metrics, which combine information about (a) the number of manufacturing plants in each industry in the region, and (b) the volume of U.S. imports of the products made by each of those industries. The current import exposure status for our region is given below. The 2 key numbers in this table are those on the outside. Imports Up 90.6% means that GLTAAC estimates 91% of the manufacturing base in Ohio, Indiana, and Michigan is currently facing rising imports (measured on a year-over-year basis). Average Increase 9.2% means that the volume of imports faced by all manufacturers in the region has increased by an average of 9% over the past year. (For a more precise explanation of these statistics are how they are calculated, see here.) Viewed historically, 90.6% and 9.2% are both very high. The other numbers in the table offer additional detail. They describe the distribution of import exposure across the manufacturing base, and partially disaggregate the first 2 stats. (Returning to the Import Exposure Status table, above) GLTAAC estimates that only 9% of manufacturers are in industries which are experiencing decreasing imports; while 22% are in industries where imports are up less than 5%; 26% are in industries with imports up between 5-10%, and 43% are in industries where imports over the past year have grown by more than 10%. The value of this distribution can be seen by looking at its change over time. (GLTAAC has been collecting and compiling import data for almost 20 years.) As the note under the Import Exposure Status table indicates, the most current import data available as of this writing is through December 2018. That means all of the numbers are comparing the 12 months ending 12/31/18, to the 12 months ending 12/31/17. (The release of detailed import data typically has a delay of about 2 months, which is actually quite prompt compared to other economic info.) Import numbers for January 2019 will be published shortly. When that happens, GLTAAC will calculate an Import Exposure Status for the 12-months ending 1/31/19, compared to the year ending 1/31/18. The graph below provides a breakdown of import exposure – the “other numbers” in the table – from January 2011 through December 2018. Explanation of Graph – Where the lines hit the vertical axis on the right is the most current data – as of 12/31/18. Note that the first line from the bottom (the one topping the dark red area) hits the right axis at 43% (indicating that an estimated 43% of the region’s manufacturing base was facing imports that increased by more than 10% in CY18 compared to CY17); the next line intersects at 69% (43% + 26%, showing that 26% of the manufacturing base was experience an increase of imports of between 5 and 10%), and the last line hits the axis at 91% (43% + 26% + 22%). These are the numbers in the Import Exposure Status table. Visually, the more red, the greater the import exposure over time; and the greater the import exposure, the more likely companies have directly lost business to foreign competitors (and might qualify for the TAAF program). As can be easily seen, import exposure has increased significantly since late 2016, and it is currently very high. This info is combined with the number of establishments in each industry, which is used to define the total manufacturing base in the Great Lakes region. Imports Up = number of establishments in all industries with increasing imports / total number of establishments in the region. Imports Down = number of establishments in all industries with decreasing imports / total number of establishments. Imports Up < 5% = number of establishments in industries with imports up less than 5% / total number of establishments in all industries. Other Imports Up X% = methodology same as Up < 5%. Average Increase = weighted average of each individual industry’s % change in imports = the summation of (number of industry establishments)(industry’s % change in imports) / total number establishments in all industries. Imports = Customs Value of Imports for Consumption from the USITC DataWeb aggregated by industry for all manufacturing industries (NAICS 31-33). Manufacturing base = establishments by industry from the most recent County Business Patterns (CBP), currently 2016. Data limitations are the primary reason why all of GLTAAC’s import exposure statistics must be considered estimates. Nevertheless, the stats are meaningful and sound. First, U.S. import data are used – meaningful state-level information is not available. Furthermore, all import data are categorized and collected by Harmonized Tariff Schedule (HTS) code. These codes are then compiled by the USITC into NAICS industry codes. The concordance, however, is imperfect. There are 364 6-digit manufacturing NAICS codes. Only 334 have import data. Those industries without import data are excluded from the calculations. Thus 8% of industries are not included. However, a few of these industries are large, such that 20% of manufacturing establishments have no import data and are thus not included. There is a several year lag between the collection of CBP information and its release. The establishment data used is thus somewhat dated. Although these data issues do force some assumptions, GLTAAC does not believe that they significantly skew its import exposure statistics.